I attend continuing legal education for my career as a paralegal—a lot of continuing legal education. Besides being a requirement of the two legal certifications I have, I am also a member of my professional association, and involvement in the association means participation in the events we present. I am a natural sponge and love learning about new topics, exploring new ideas, and finding new ways of doing things. I like to try on concepts, see if they fit me like a comfy pair of pajamas or if they are like an itchy wool sweater in Phoenix in the middle of summer. Luckily, most of the continuing legal education seminars and meetings I attend are interesting, but there are those that are not. I find, however, that if my mind begins to wander off of the topic I am listening to, typically it wanders to a grocery list, work or life to do list, or my next vacation. Sometimes when I am really not engaged, my mind wanders to those big ideas I have. You know the ones, the goals that have not seen any action in a while. Those really big life altering projects I wish I would start chewing on a bite at a time. When those things start to happen, I remember there are rules of engagement that require me to buckle down and plug back in. These concepts do not apply only to continuing legal education, but to any situation in which you are not fully present—meetings, presentations, seminars, driver’s education training, educational classes, phone calls, and webinars. 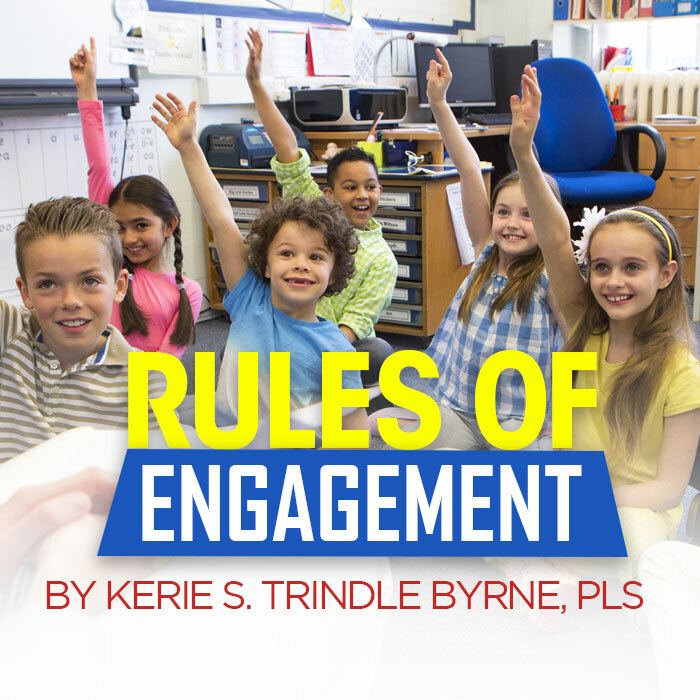 I will share my rules of engagement here with you, so the next time you catch yourself checking out, you can reconnect and impress not only your boss, teacher, or coworkers, but yourself. It is not solely the presenter’s job to entertain you and keep you engaged. Don’t get me wrong. There are things a presenter can do to keep her audience engaged in the topic, and maybe I will write about that next, but it is not solely her job. There is a part that each member of the audience must play. The onus is on you, the audience member, to stay committed and focused. Chances are you are there for a reason. Either you are being paid to be there, in the case of a work meeting or phone calls from clients; you are required to be there, in the case of driver’s education training or school; or you are paying to be there, in the case of continuing legal education, seminars, or webinars. No matter the reason for you to be there, be there and be an active listener. Active listening is an art form that, once mastered, will keep you connected to people in a way that will enhance your professional and personal life. Active listening involves being present in the moment and taking in everything the other person has to say without waiting for your own chance to speak or interject. You are not just listening for the words the other person is saying, but you are listening to understand and retain the concepts. Watch body language, listen to intonation, rate of speech, and other nonverbal cues that the person is using to convey their message. Look at the other person and let them know you are engaged and focused. If you agree with something, nod your head. If you think of something or you have a question, write it down quickly and go back to listening. Smile and use other facial expressions to communicate that you are actively listening. It will make a difference. If you are starting to feel your mind wander, figure out what is in it for you. To do that, ask yourself a series of questions. I start off by asking myself, “How does this apply to my daily work?” Could this topic be tangentially related to the work I do on a daily basis in the future? If the answer is no, or it is yes but it is still not enough to keep me motivated to actively listen, then I move on to my next question. How does this apply to my personal life? For instance, I have found myself sitting in on more seminars about estate planning than I care to attend. I am not an estate planning paralegal. I am not close to retirement age and feel as though I do not have enough assets to worry about estate planning at my age. Whether that is true or not remains to be seen; however, my parents are both close to retirement age. Is there something in the estate planning continuing legal education that I can learn that would make me better situated to help my parents navigate retirement? If I am still unable to find a way that the interaction relates to my work or personal life, I ask myself how it relates to my extracurricular activities. Maybe I am a member of a homeowner’s association and need to learn about city ordinances. Maybe I am a member of my kids’ Parent/Teacher Association and need to know about school zoning. Maybe it is not the topic itself that pertains to my extracurricular activities, but the manner in which it is being presented. Did the presenter tell you about some computer program or tool you could use? If asking these questions does not reengage your brain, I have some other tips. Treat the interaction as a class. If you do not understand the concept, or you are unable to relay key facts, ideas, and principles to someone else by the end of the interaction, you have failed. This appeals to my competitive nature. I feel it is my job in the world to know as much as I can about as many things as I can. So, if someone is talking to me on the phone and I am having difficulty staying focused, I will sometimes employ this tactic. If they mention a word or phrase that I have never heard before, I ask them what it means. This happens all the time in the legal world, especially with acronyms. People use different words and phrases and I do not always know what they mean, so I ask. Also, if I think I have understood what someone is saying, but I want to be sure that my brain was engaged the whole time, I will repeat the key phrase or concept back to them and ask them to verify that I got it right. Asking questions frequently during an interaction is another way to trigger your brain to stay in the game. Take notes. When I find myself disengaging, this is the singular thing that helps me stay engaged. I take voracious notes. Sometimes, I test myself to see if I can write down everything that is said. When I am participating in a client meeting, I am listening not only for the facts of their case, but I am also listening to subtext instructions from my attorney. I sometimes come out of an hour-long meeting with a client having gone through an entire legal pad. This helps me not only to stay focused on what is being discussed, it also helps refresh my memory when something from that meeting comes up again during the case. When I am attending a seminar for my professional association, one way for me to stay engaged is to be a force for marketing. I can easily connect to Facebook and/or Twitter, which I have linked to each other, and type quick 144-character key concepts about the seminar I am attending. So long as my device is charged and I am not actively engaged in another way, I am likely engaged in social media marketing for my association. If I am listening for the concepts I think other people might be interested in, they may read my Facebook post or my tweet and decide to attend our next event. It is a way for me to stay plugged in, engaged, and do something proactive. Sometimes, I post something that leads to questions I can ask the speaker in real time and respond to on social media. This type of engagement keeps me focused on the interaction and allows me to feel like I am sharing important information with my contacts. Understand, this type of engagement is not appropriate in many situations, so use your best judgment. Remembering these rules of engagement can help you get the most out of every interaction. Focusing on being an active listener, determining how the interaction relates to your work life, personal life, or extracurricular activities, treating the interaction as a class you must pass and not fail, taking notes, and marketing when appropriate will keep you focused and help you soak up as much information as possible. The next time you find your mind wandering to what you need from the store, what work deadlines you have to complete, or your next European vacation, consider employing one or more of these methods to keep you involved and help you be all there. Kerie S. Trindle Byrne, PLS, has been a legal professional for 19 years and has worked in many different capacities in the law firm environment. Through determination, hard work, and on-the-job training, Kerie gained the background knowledge and skills to perform as a legal support professional. Believing education to reinforce her skills was important, Kerie attended Phoenix College and earned her Associate of Arts Degree in Paralegal Studies, obtained her PLS certification from NALS, and obtained her CP certification from NALA. Kerie has practiced in many areas of law and is currently employed as a family law paralegal with David Horowitz of May, Potenza, Baran & Gillespie, P.C. Kerie is a self-proclaimed Disney addict and when she is not working, teaching, or volunteering with NALS, she is spending time with her husband, kids, family, and friends at Disneyland.